Layers of raised bold milgrain decoration cover the surface of this handsome 14K yellow gold wedding band. The surface of the band is darkened to add greater depth to the ring. 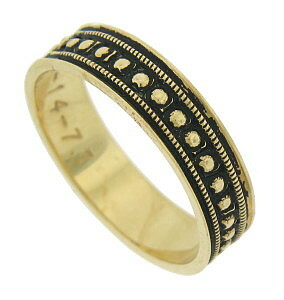 The ring measures 5.80 mm in width. Size 11 3/4. We cannot re-size.